Image Technology ER- 650C Concentrated Emulsion Remover (1:20) - RC Screen Shop & Supply Co.
SKU: ITI-ER650C. Categories: Chemicals, Image Technology. Tags: ER-650C, Image Technology, concentrated emulsion remover, emulsion remover. ER-650C is a biodegradable and odorless, low foaming, sprayable liquid emulsion remover concentrate for all types of stencil systems. This product is to be diluted up to 30 parts water to 1 part ER-650C or higher depending on emulsion type and thickness for best economy. 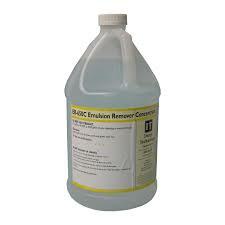 When this product is used emulsion and diazo staining are greatly reduced.